At Cokl Café coffee tastes differently. They grill it by themselves so it is always fresh and mixtures are a subject of their current offer. During our visit, we were offered a mixture of Ugandian and Mexican. They promote it under »Buna cofee« brand and what makes it even tastier is the fact that it is a subject of a fair and direct trade. Coffees are prepared with different techniques and in a variety of ways. Feel free to ask the staff what are the options. Different equipment for coffee making could be bought here too. The place is fairly small but the atmosphere is warm. As they say: »The place is small but the coffee is big«. Direction: castle funicular, opposite the Puppet Theatre. Vintage furniture, books, a piano. 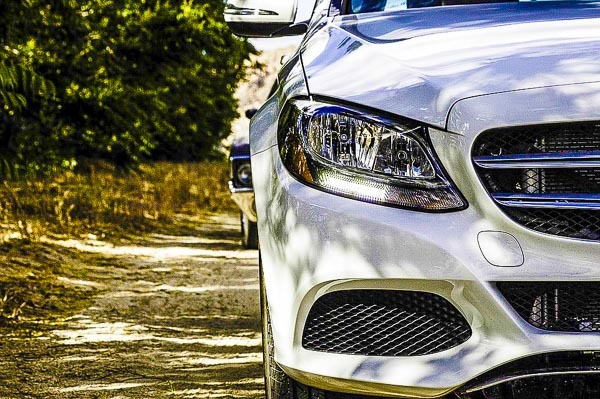 It`s cosy, it`s pleasant and it`s for all generations. 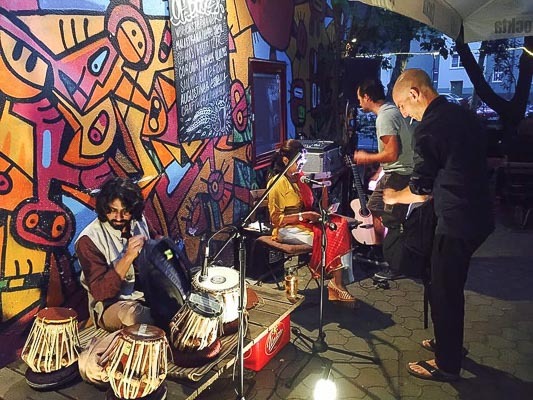 Concerts, lectures and other cultural events are frequent, while every Sunday evening an “open mic” event is scheduled to participate or to simply observe and enjoy. Daktari can be a party place where one comes for a beer in the evening to meet friends, it can be your living room for a morning or afternoon cup of tea or coffee and it can be a place where you bring your children for a glass of juice. After all, Puppet Theatre is just beside it. They serve snacks and a wide selection of Slovenian craft and also international beers. There is a smoking room in the back. The carefully designed interior of TOZD Bar feels homey and pleasant and every item in the bar is available for purchase. In the morning they visit a farmers` market to make a soup or a sandwich for their customers. A place to visit if you have a soft spot for craft beers or good coffee. LGBT friendly and located directly by the river side. LP retains the character of the building it is in – Slovenian Academy of Science and Arts. The interior is equipped with books, there is also a computer to use. Its walls are not only to hold the building but they also give space to occasional exhibitions. They have a nice selection of wines and serve home pies and croissants. DJ evenings on Friday nights. 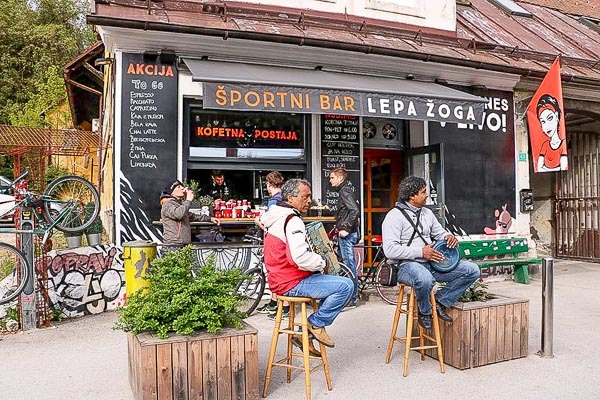 Pritlicje Bar with its music, space and events adresses and questions a man from an urban environment. 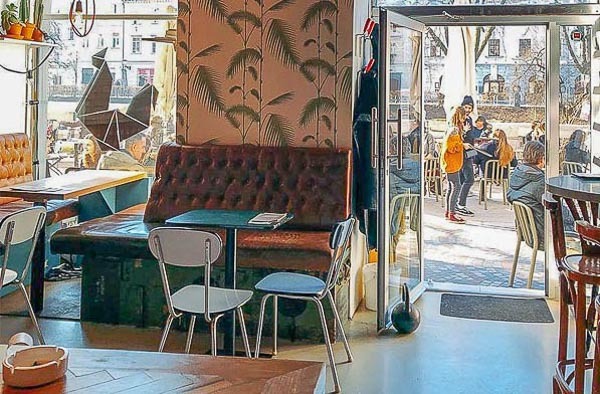 It is not only a bar or cafe, it is also a gallery of comic books and a spot for lectures and public debates about present social and cultural phenomena. Also very LGBT community supportive. Concerts of urban electronic music are frequent. 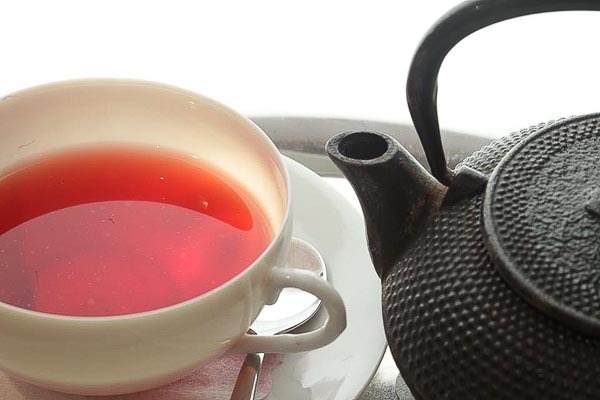 Among 80 sorts you can find white, green, black, fruit, herbal and red teas. Probably the most special one is a sunflower and Plecnik`s herbal tea, prepared the way the great architect Joze Plecnik used to enjoy it. Their ice teas with ginger or orange juice are natural and homemade and feel refreshing on hot summer days. Snacks like toasts, croissants, and pastry are also on the menu, homemade cakes and macrons are definitely worth trying. If you are not a tea expert, don`t worry. Just follow waiters` advice about choice and ways of preparation. There is a lovely summer garden under the chestnut and wild cherry trees with a view of the river. Zmauc is one of those cool bars of Ljubljana. A good location, well-chosen music and a bohemian atmosphere make this place special and it is very popular among arty types and students. Parties take place in the evenings, while during the day it serves as a café and a restaurant. Although this L-shaped bar seems relatively small, it is constantly full. Despite that it doesn’t feel crowded since smokers occupy the outside part. This is a bar for all the sports fans. On numerous TVs they screen all the important sport events from the world of football, tennis, hockey, basketball etc. Beside a wide selection of local craft beers they also offer snacks. 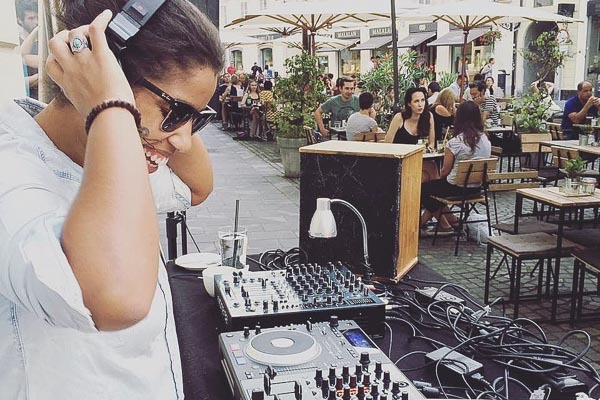 There is also a summer garden available where occasonal where DJ evenings happen at times. The bar is located by the Tivoli Park. Ljubljana beer paradise. There are more than 150 different home and international beers on offer in this neat pub, about 10-15 on tap. They also have a wide selection of teas and wines. 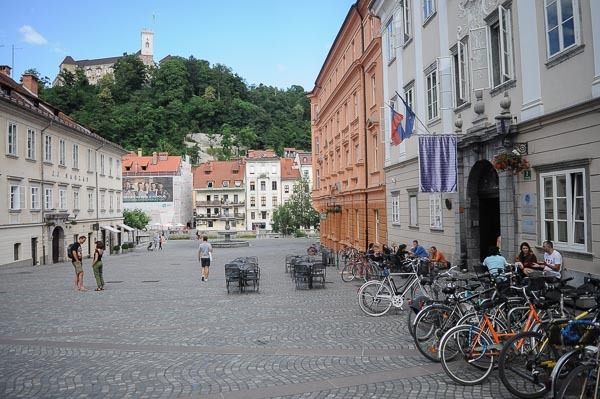 If you are eager to taste some of the best Slovenian craft beers, Sir William`s Pub is the right address. You can also join us on a Lju-BEER-ljana Tour, where we introduce you to very different local craft beers and their stories. 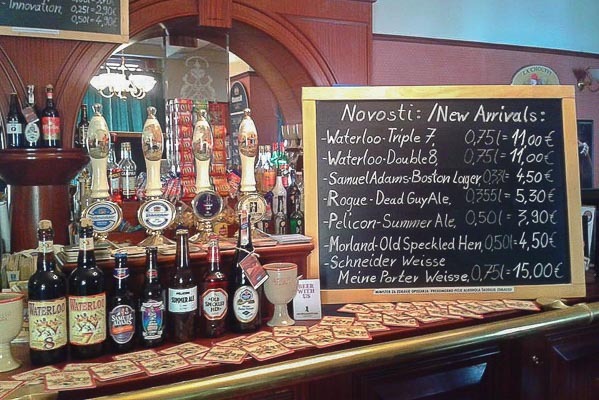 Cutty Sark is an English style pub worth visiting for the wide selection of international beers they offer and also for your favourite sport match to follow on a number of big screen TVs. 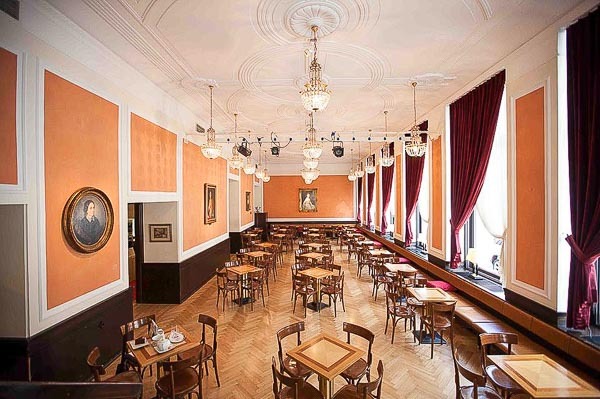 The café of the Grand Hotel Union is a cafe with a story and tradition. It is a place to discuss 100-year-old memories of our forefathers sitting on the same chairs. 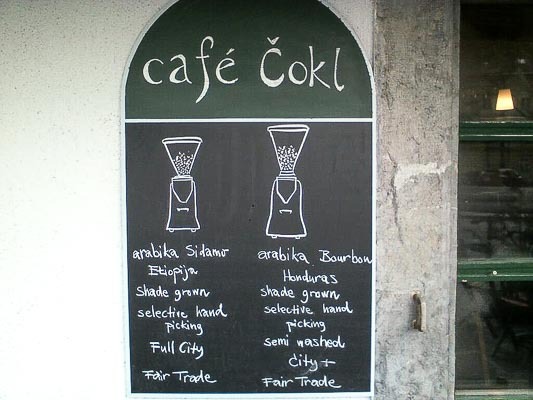 A place to discuss politics, to do business or simply to have a chit-chat over a cup of coffee served in a Balkan “dzezva”. The place is the same as it used to be 100 years ago just the smoke of cigars is gone. A café during the day, it becomes a stage of culture in the evening. There is a lovely summer terrace just outside the hotel. 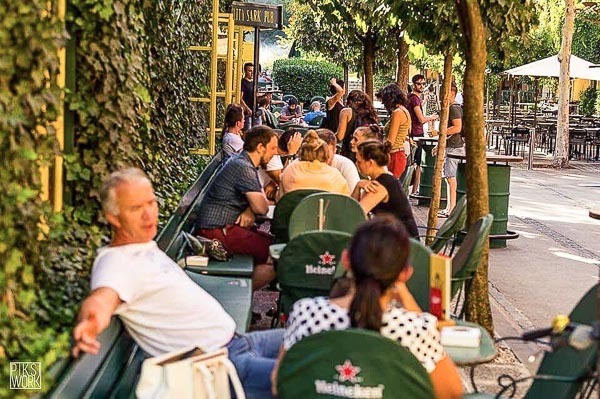 SEM Café is about 5-10 min walk from the very centre of town, located close to the Metelkova district and is part of the Slovene Ethnographic Museum. We have not tasted them yet but delicious cakes are said to be offered to. They serve great coffee, teas and there is also a selection of craft beers to choose from. 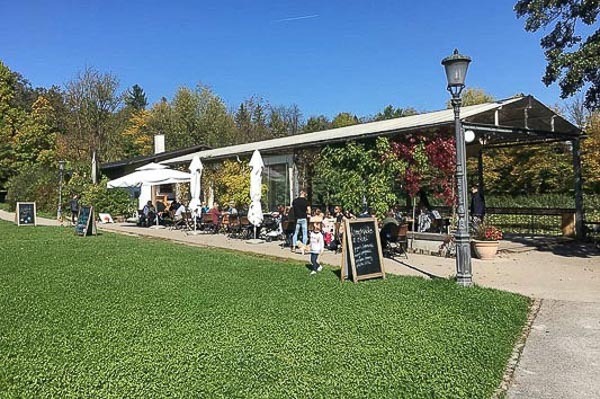 Probably the best part of this cafe is a big lawn with comfortable chairs where you can enjoy sunrays or let your children freely play around. SEM Café is also a place for exhibitions, book presentations, literature evenings or dance nights (swing on Tuesdays and Salsa on Fridays). Open every day until 1 am. Welcome to check about other dance events in Ljubljana HERE. This bar and café is worth visiting if you like your coffee with a view. 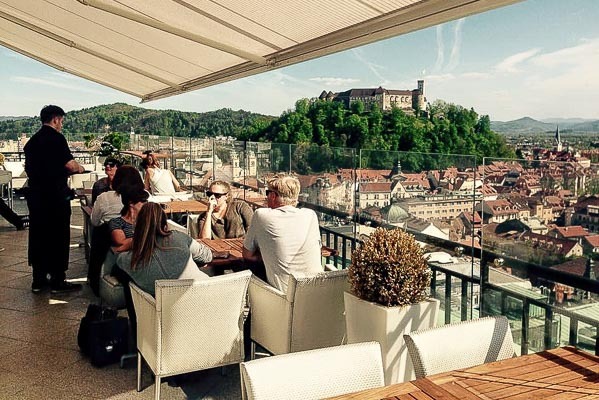 It is placed on the top of Neboticnik building in the center of town and has an open terrace with an amazing 360 view over Ljubljana. Open until 1 am, at the end of the week until 3 am. 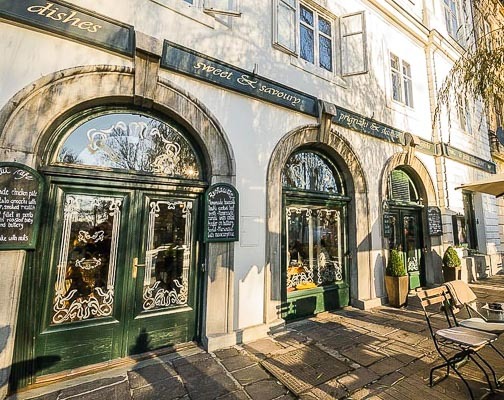 If you’ve got a sweet tooth, you should mark Zvezda Café on your map as a place to stop and rest while sightseeing. 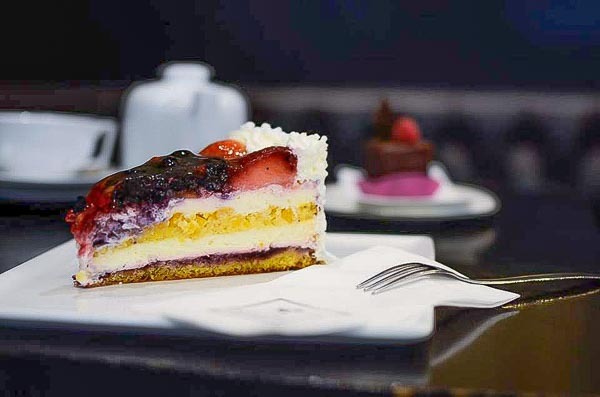 The home-made cakes they bake are said to be the most delicious in the city. There are also gluten-free and sugar-free options to choose from. Their ice-cream is pretty well-known too. It is located in the city centre just by the Congress Square. There is also a small shop beside the cafe to take their goodies with you if you like. Colnarna is a café with probably the most beautiful setting in Ljubljana. 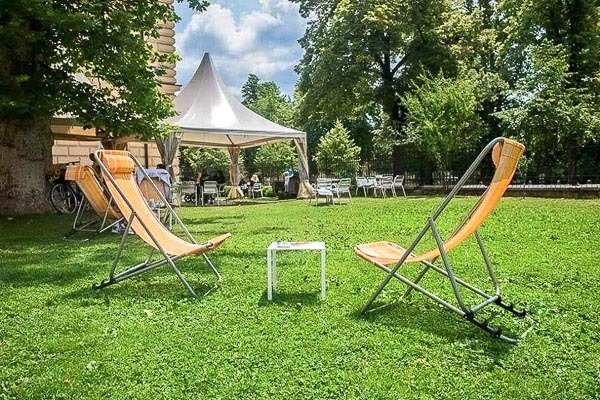 As it is placed by a pond in Tivoli Park, it is a place to enjoy the sun and nature while sipping your coffee or tea. With an adjacent meadow it is perfect for children to freely run around. Beside drinks they also serve delicious cakes. 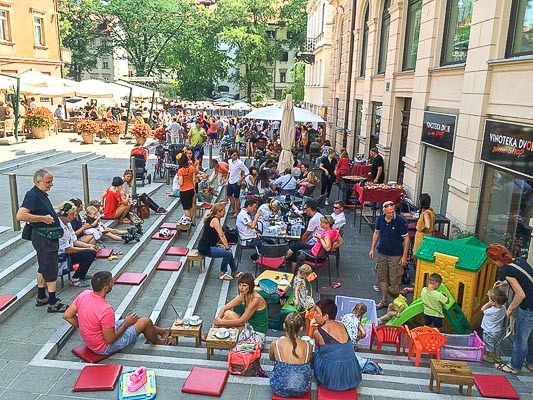 Dvorni Bar is the most popular wine bar in Ljubljana city centre. Here they will treat you with a wide variety of domestic and foreign wines, hot beverages and delicious snacks. You can leaf through a newspaper, organize a party or just relax in the pleasant ambiance after a hard day. Since it is a family friendly bar with a play area for children, parents can relax. 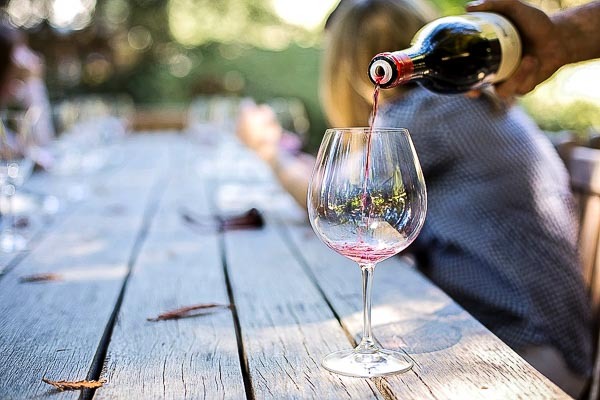 If you are lucky you may hit on one of many cultural events organized in this wine club, like a book or musical presentations or concerts. 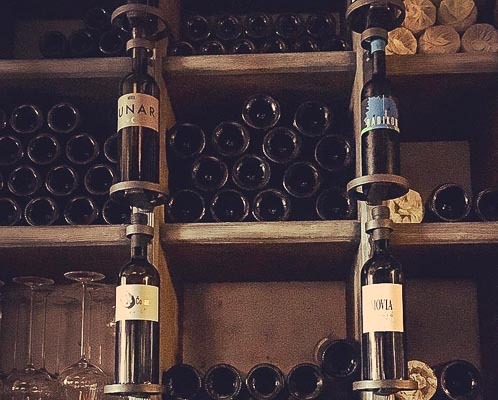 Every second Wednesday there are promotions of recognized Slovene and foreign winemakers. 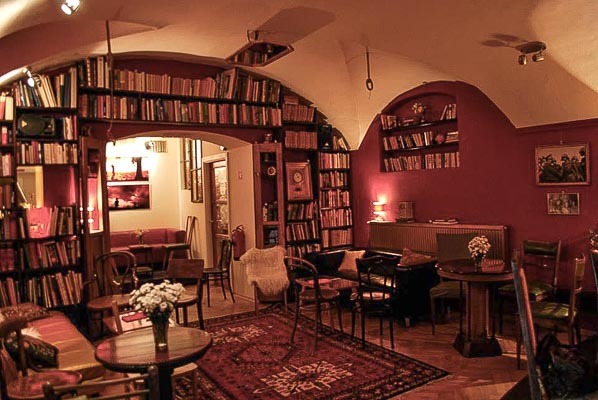 This cafe is situated near Krizanke Monastery, or (if you prefer) near the National Library. It is an ideal choice for a cup of coffee, fresh orange juice or a glass of wine. There is a lovely garden in front of it for summer days. This is a bar just off the tourist trail. It’s a walk from the city centre along the river, past the traffic lights. 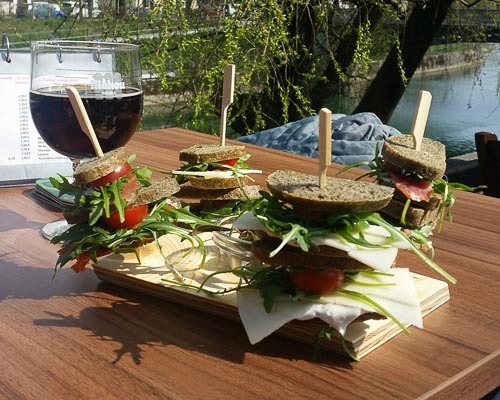 They offer international beers, various tapas, olives and the famous Kranjska saussage. There is a super lovely summer garden under tree tops with a view of the river. Occasionaly the bar hosts an exhibition af a local artist. Romantic and expensive, take your chic girlfriend here, if you can afford it. Although a glass of wine comes to some 5 euros, I bet you can’t stop yourself drinking one or two. Located just next to the Town Hall in the center of the Old Town.